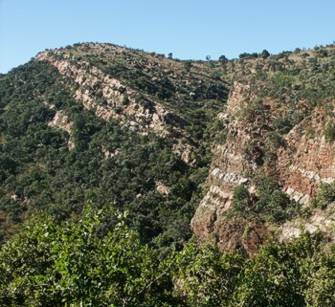 This area includes the eye-catching cliffs around the Witportjie Waterfall. The Geological Trail, with its stunning views, also starts in this section of the Garden. Alongside the waterfall, on the cliffs, a pair of Verreaux Eagles (Black Eagles) has been resident for over 30 years. The waterfall is the most popular spot in the Garden. Walking trails around this area are self-guided.